The blood vascular system of higher vertebrates is crucial for the nourishment of organs throughout the organism, as well as for the removal and excretion of metabolic waste products. With the heart as the central pumping organ, the circulation is divided in a high-pressure arterial system that, with exception of the lung circulation, carries the oxygenized blood, and a low-pressure venous system that returns the deoxygenated blood back to the heart. Between arteries and veins a highly organ-specific network of capillaries mediate the exchange between blood and interstitial compartment. 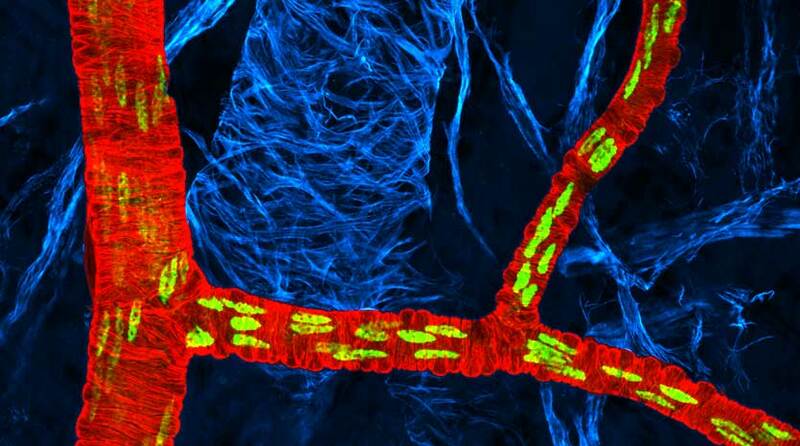 Due to their function as high- and low-pressure "tubing", arteries and veins differ considerably in their morphology and in their molecular signature. For example smooth muscle cells (SMCs) are mainly attached to arteries, supporting the endothelium as the innermost layer of blood vessels to resist pressure and to modulate vessel diameter. Veins instead develop valves, which reinsure unidirectional blood flow in absence of sufficient pressure as a driving force. The functional diversity of the arterial and venous endothelia is regulated through a complex system of signalling pathways and downstream transcription factors. Here we report that the transcription factor Sox17, which is known as a regulator of endoderm and hemopoietic differentiation, is selectively expressed in arteries, and not in veins, in the mouse embryo and in mouse postnatal retina and adult. Endothelial cell-specific inactivation of Sox17 in the mouse embryo is accompanied by a lack of arterial differentiation and vascular remodelling that results in embryo death in utero. In mouse postnatal retina, abrogation of Sox17 expression in endothelial cells leads to strong vascular hypersprouting, loss of arterial identity and large arteriovenous malformations. Mechanistically, Sox17 acts upstream of the Notch system and downstream of the canonical Wnt system. These data introduce Sox17 as a component of the complex signalling network that orchestrates arterial/venous specification. Because of the apparent coupling of blood pressure to vessel morphology, physical parameters were considered to induce the vascular differentiation into arteries and veins via flow-/pressure-sensing pathways. 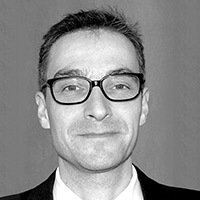 In the present article in Nature Communications, Corada and colleagues of the research group headed by Professor Elisabetta Dejana at IFOM report that arterial determination of endothelial cells is blood flow-/pressure-independent, providing novel insight in vascular signaling and differentiation. The group of Professor Dejana has a been working at the cutting edge of vascular research with major contribution to the molecular dissection of endothelial junctional complexes and their role during developmental angiogenesis as well as in health and disease. Particularly, Corada et al. could show that the HMG-box transcription factor Sox17 determines arterial fate by directly regulating Notch4 and delta-like 1 in endothelial cells. The Notch pathway has been shown to be crucial for the regulation of angiogenic processes, influencing the "sensitivity" of endothelial cells for the growth factor VEGF in their environment and contributing to vascular maturation. In a previous publication Professor Dejana’s group has shown that the Wnt/β-catenin pathway can directly regulate the Notch ligand delta-like 4 (Dll4). Interestingly, in the present publication the authors show that Sox17 acts downstream of the Wnt/β-catenin pathway and in turn activates Notch/Dll signaling. Apparently, this neat, consecutive interaction of different pathways is independent of blood flow, as the first arterial markers (such as ephrinB2 etc.) are detectable even before blood circulation starts during embryogenesis in the mouse. This novel finding establishes the transcriptional regulator Sox17 as a crucial link in the chain of signaling events leading to arterial differentiation. A major strength of this work is the smart combination of in vivo and in vitro experiments to decipher the molecular crosstalk of Wnt/β-catenin, Sox17 and Notch/Dll signaling pathway. These exciting findings also raise a number of further questions for example which are the upstream events initiating Wnt/β-catenin signaling in a subset of endothelial cells and which other arterial genes are influenced by Sox17. From a medical point of view, these findings will be critical for the further understanding and eventually therapy of deleterious arteriovenous malformations, which may lead to spontaneous bleeding often in the brain -hemorrhagic stroke- of affected patients.